WORTH TRAINING will show you how to install and service A/C’s. 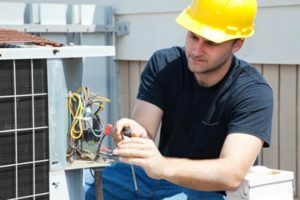 This Residential Cooling course will introduce you to how the cooling equipment works, how to identify potential problems, and how to diagnose problems. It will introduce you to all the necessary tools you need to a service call, and give you practice using them. It will take you through the install process from ‘cutting in the coil’, to the initial start-up. There will be lots of ‘hands on’ work as you practice using the tools needed for the install. You will learn how to evacuate a system, and charge a system. You will learn to troubleshoot systems controls, and to troubleshoot system efficiency. Upgrade your resume to include A/C training! So, check the calendar for dates that suites you and sign up now!